In all industrialised countries, activities are underway towards using bioethanol as fuel. Economic or manufacture of bioethanol is highly important in this context. Modern bioethanol technology increases the yields from hydrolysis and fermentation. The decanter dewaters the stillage after distillation and separates the solid from the thin stillage. The thin stillage is concentrated into syrup. Following this, it is blended with the solid from the decanter. 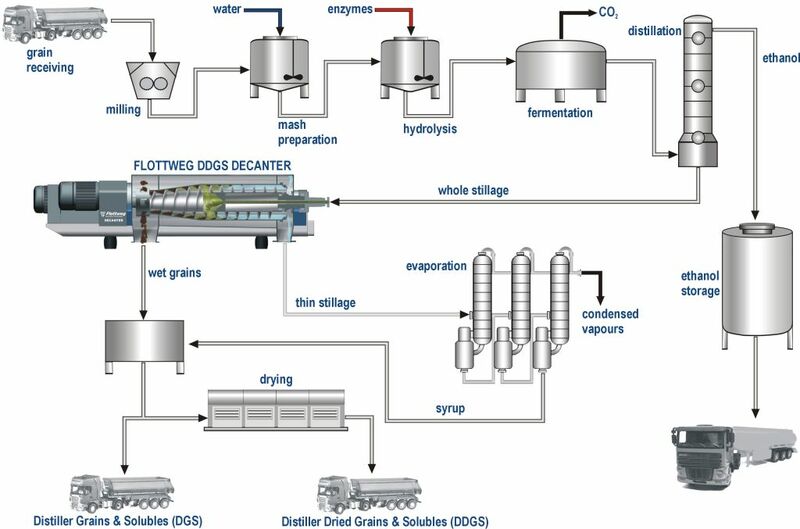 Depending on the requirements, the solid is thermally dried with the syrup to produce DDGS (distiller dried grain & solubles), or is used dried as a high-protein cattle feed. Flottweg manufactures special decanters for dewatering stillage – designed for the requirements of the bioethanol industry. They are available in five sizes which cover the performance range up to approx. 75 m3/h stillage. The decanter achieves higher total dry solids after dewatering of the stillage. This leads to reduced requirements on drying and cuts energy consumption. The decanter largely separates off the solids from the stillage. This leads to less maintenance work and increased performance for the evaporation. The Flottweg Simp-Drive® regulates the differential speed according to the scroll torque. This means the Flottweg decanter automatically adapts to different load levels, and dewaters the fed-in stillage to achieve the maximum total dry solids in each case. Compact external dimensions and short installation clearances mean the decanters have a relatively low space requirement. They are easily accessible for maintenance work, and exceedingly easy to service. Flottweg is at your disposal 24 hours a day for global spare parts deliveries and service.